A contrastive analysis of the factorial structure of the PCL-R: Which model fits best the data? Análisis de contraste de la estructura factorial de la PCL-R: ¿qué modelo se ajusta mejor a los datos? The aim of this study was to determine which of the factorial solutions proposed for the Hare Psychopathy Checklist-Revised (PCL-R) of two, three, four factors, and unidimensional fitted best the data. Two trained and experienced independent raters scored 197 prisoners from the Villabona Penitentiary (Asturias, Spain), age range 21 to 73 years (M = 36.0, SD = 9.7), of whom 60.12% were reoffenders and 73% had committed violent crimes. The results revealed that the two-factor correlational, three-factor hierarchical without testlets, four-factor correlational and hierarchical, and unidimensional models were a poor fit for the data (CFI ≤ .86), and the three-factor model with testlets was a reasonable fit for the data (CFI = .93). The scale resulting from the three-factor hierarchical model with testlets (13 items) classified psychopathy significantly higher than the original 20-item scale. The results are discussed in terms of their implications for theoretical models of psychopathy, decision-making, prison classification and intervention, and prevention. Se diseñó un estudio con el objetivo de conocer cuál de las soluciones factoriales propuestas para la Hare Psychopathy Checklist-Revised (PCL-R) de dos, tres y cuatro factores y unidimensional era la que presentaba mejor ajuste a los datos. Para ello, dos evaluadores entrenados y con experiencia evaluaron de forma independiente a 197 internos en la prisión Villabona (Asturias, España), con edades comprendidas entre los 21 y los 73 años (M = 36.0, DT = 9.7), de los cuales el 60.12% eran reincidentes y el 73% había cometido delitos violentos. Los resultados mostraron que los modelos unidimensional, correlacional de 2 factores, jerárquico de 3 factores sin testlest y correlacional y jerárquico de 4 factores, presentaban un pobre ajuste con los datos (CFI ≤ .86) y un ajuste razonable del modelo jerárquico de tres factores con testlets (CFI = .93). La escala resultante del modelo de tres factores con testlets (13 ítems) mostró un poder de clasificación de la psicopatía significativamente superior al de la escala original (20 ítems). Se discuten las implicaciones de los resultados para los modelos teóricos de la psicopatía, la toma de decisiones, clasificación e intervención penitenciaria, y la prevención. Psychopathy is a construct characterized by affective, interpersonal, and behavioural traits (Morrissey et al., 2010) associated to irresponsible and impulsive behaviour, contempt for and violation of social norms (Flores-Mendoza, Silva-Alvarenga, Herrero, & Abad, 2008), deep affective deficits, and a lack of respect for the rights of others (García et al., 2008; Hare, 1996, 2003; Torrubia, Poy, Moltó, Grayston, & Corral, 2010; Vien & Beech, 2006). Research in psychopathy has been enmeshed in controversy since its very inception owing to the rivalry between two theoretical approaches opposed as to the definition and measurement of the construct itself (Cooke, Michie, Hart, & Clark, 2004; Hare & Neumann, 2005). On the one hand, the traditional European approach grounds its definition of psychopathy on emotional and interpersonal aspects and rejects the notion that criminal behaviour is a core feature of psychopathic disorder – instead it is regarded as a secondary symptom or effect comparable to other contingencies such as illicit substance abuse (Cooke et al., 2004; Skeem, Mulvey, & Grisso, 2003). This approach has been corroborated by empirical data linking crimi n al behaviour with behavioural items on the PCL-R (delinquency and lifestyle), but not with those aspects which are traditionally associated to psychopathy, that is, affective and interpersonal ones (Eisenbarth, Osterheider, Nedopil, & Stadtland, 2012; Hodges & Heilbrun, 2009; Walters & Heilbrun, 2010; Þukauskienë, Laurinavièius, & Èësnienë, 2010). This has led some authors to postulate that behavioural items or criteria are useful for predicting violent behaviour (Skeem, Mulve y et al., 2003; Cooke, Michie, & Skeem, 2007), but lack diagnostic value. Conversely, the contemporary North American approach subscribes to the behavioural approach that defines the disorder in terms of antisocial behaviour (Skeem, Mulvey et al., 2003), effectively establishing a relationship between psychopathy and criminal behaviour using the criteria of psychiatric nosological systems. This perspective has been endorsed by the American Psychiatric Association under the heading of Antisocial Personality Disorder (APD), defined by the classification system as synonymous to psychopathy (American Psychiatric Association, 1980, 1994, 2000, 2013). However, other authors, such as Hart and Hare (1996), reject APD and psychopathy are different expressions of the same entity and have developed a definition integrating both viewpoints, which provides the theoretical framework for their evaluation system (Garrido, 2002; León-Mayer, Asún-Salazar, & Folino, 2010), i.e., the Psychopathy Checklist-Revised (PCL-R) (Hare, 1991, 2003).Though psychopathy was initially conceived as a unitary disorder, research on Hare’s PCL-R has revealed that psychopathy is composed of facets that are different though correlated (Hall, Benning, & Patrick, 2004). This finding has led to the development of at least eleven factorial structures (Hauck, Pereira, & Martins de Almeida, 2014) with inconclusive empirical results, the main ones of which will be reviewed below. The two-factor model (Hare, 1991; Harpur, Hakstian, & Hare, 1988) described a higher order construct (psychopathy) underpinned by two correlated factors: affective and interpersonal (factor 1), and social deviation (factor 2). This structure has been extensively researched to analyse the relationship between each factor and other variables such as gender (Nicholls & Petrila, 2005), substance abuse (Pham, Malingrey, Ducro, & Saloppé, 2007), empathy (Hare, 2003), r elational aggression (Schmeelk, Sylvers, & Lilienfeld, 2008), and delinquency (Librán & Ral, 2003; García et al., 2008). 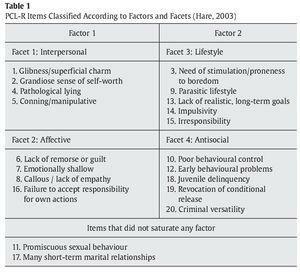 In the Psychopathy Checklist–Revised (PCL-R), Hare (2003) reviewed the original two-factor structure into four-facets: interpersonal, affective, lifestyle, and antisocial. In the revised structure, factors 1 and 2 of the original model have been subdivided into facets: facets 1 and 2 (factor 1), and facets 3 and 4 (factor 2), and items not saturating any factor (see Table 1). On the basis of this structure, several configurations have been identified, the most prominent of which are the four-factor hierarchical model (Hare, 2003) and the two-factor, four-facet hierarchical model (Bolt, Hare, Vitale, & Newman, 2004; Hare, 2003; Kennealy, Hicks, & Patrick, 2007). These models have been empirically corroborated by numerous studies (e.g., Hill, Neumann, & Rogers, 2004; Vitacco, Neumann, & Jackson, 2005; Þukauskienë et al., 2010). Bearing in mind two-factor models are primarily drawn from prison samples, generalizations to other populations are tentative at best. Cooke and Michie (2001) have developed a three-factor model with a hierarchical structure of a higher order construct, psycho-pathy, and one more level between it and the factors, the testlets, that represent a strong association between two or more items of a factor that mediate the relationship between the factor and the measurement. The three-factor model entails two fundamental changes in comparison to the traditional two-factor model (Skeem, Mulvey et al., 2003). First, the original emotional factor was split into two independent factors (interpersonal and affective), and second, PCL-R items referring to delinquent behaviour were eliminated on the basis of empirical evidence that typified them as poor indicators of psycho-pathy, primarily, due to the concurrence of one or more of the following circumstances: poor discriminatory capacity, absence of fundamental traits underlying the concept of psychopathy and/or expression of antisocial behaviour as a key element (Torrubia et al., 2010), as well as items not saturating any of the factors (promiscuous sexual behaviour, and many short-term marital relationships). Thus, 3 factors, Interpersonal (Factor 1, arrogant and deceitful interpersonal style), Affective (Factor 2, deficient affective experience), and Behaviour/ Lifestyle (Factor 3, impulsive and irresponsible) were obtained (Cooke et al., 2004). Factors 1 and 2 were a subdivision of the original factor 1, whereas factor 3 included items from the original factor 2 without those items representing antisocial behaviour. This three-factor model is coherent with the standard clinical descriptions of psychopathy such as personality disorder (Cooke et al., 2004; Morrissey et al., 2010), in which delinquent behaviour is not conceived as a feature intrinsic to psychopathy (Cooke et al., 2004), but is rather associated to an array of disorders, e.g., psychotic disorders, substance abuse, intellectual developmental disorder (Cooke, Hart, Logan, & Michie, 2012). Ever since its design, the model has been developed and validated by multiple samples (Hillege, de Ruiter, Smits, van der Baan, & Das, 2011; Morrisey et al., 2010; Sevecke, Pukrop, Kosson, & Krischer, 2009; Shariat et al., 2010; Skeem, Mulvey et al., 2003; Þukauskienë et al., 2010), and beyond legal and forensic contexts (Book & Quinsey, 2003; LeBreton, Binning, & Adorno, 2006; Paulhus & Williams, 2002). Bearing in mind this context, the aims of this field study on a prison sample were threefold: to compare the fit of the different models to data using confirmatory factor analysis (CFA); to classify psychopathy according to how models fitted data; and to assess the effects on the classification of criminological variables related in the literature to psychopathy. A total of 197 male detainees from the Villabona Penitentiary (Asturias, Spain), age range 21 to 73 years (M = 36.0, SD = 9.7) participated in the study. In terms of academic status, 58.4% had completed compulsory education. In terms of criminal record, 41.1% of participants committed their first offence before turning 13 years of age, 60.4% were reoffenders, and 73.6% had committed violent crimes (robbery, bodily harm, and/or resisting arrest, manslaughter, attempted murder, and/or murder). All subjects freely volunteered to participate in the study. All evaluations were undertaken in the Therapeutic and Education Unit of the Villabona Penitentiary (Asturias, Spain). Two trained and experienced independent raters scored detainees. Both raters had previously assessed detainees with the PCL-R, being reliable with other different raters. The raters scored independently all participants on the PCL-R based on the prison records, and a semi-structured interview of each participant. Inter-rater reliability was assessed by intraclass correlation coefficients (ICC). A two way random model (sources of variance: participants and raters) with measures of absolute agreement was used. The inter-rater reliability was adequate (ICC ≥ .70), and significant (ps < .001) with average measures of ICCs of .89 for the PCL–R total score, ranging for items from .73 to .92. The average score was used as the final score. As for the diagnosis of psychopathy, the agreement (Cohen’s kappa) was .88 and .95 (for the scale of 20 and 13 items, respectively). Sociodemographic data and prison records. A file was opened for each participant with the following sociodemographic data (i.e., age, academic status, profession), and criminal record (i.e., age of first offence, age of first arrest, age on first time in prison, number of prison sentences served, length of minimum sentence, and the main o ffence for which the inmate was sentenced). This data was obtained from each inmate’s prison record. Psychopathy. The adapted Spanish version of the PCL-R (Torrubia et al., 2010) was used for the evaluation of psychopathy. The PCL-R is an instrument for obtaining data on different aspects of psychopathy using a semistructured interview. The instrument consists of 20 items scored on a 3-point scale (0, 1, 2), measuring the degree to which a person’s behaviour fits the description of the item. This instrument provides a general psychopathy score for 2 factors (interpersonal/ affective and social deviation), and 4 facets (interpersonal, affective, lifestyle, and antisocial). The adapted Spanish questionnaire obtained a Cronbach’s alpha of .86 for the total test score, .79 for factor 1, .87 for factor 2, .79 for the interpersonal facet, .69 for the affective facet, .81 for the lifestyle facet, and .77 for the antisocial facet. In order to compare the fit of the factorial structure obtained from the literature a CFA was performed. Models were selected taking into account the χ2 and its associated probability, the Comparative Fit Index (CFI), the SRMR (Standardized Root Mean Square Residual), and the standardχ2/df of the combinations of indexes recommen ded by Hu and Bentler (1999). As criteria for an optimum fit has been proposed χ2/df < 2-3, CFI ≥ .95, and RMSEA and SRMR < .05, and for an acceptable or reasonable fit χ2/df < 4, CFI ≥ .90, and RMSEA and SRMR < .08 (Anderson & Gerbing, 1984; Arce, Velasco, Novo, & Fariña, 2014; Brooke, Russell, & Price, 1988; Browne & C udeck, 1992; Hu & Bentler, 1999; Wheaton, Murthen, Alwin, & Summers, 1977). To assess the validity of the classification of psychopathy, the measures were compared with a one-factor ANOVA to compute the effect size using Cohen’s d, and for the association between variables, a chi-square to calculate the Odds Ratio (OR), and in turn to estimate the effect size. In order to meet the objectives of this study, different PCL-R measurement models representing a broad spectrum of theoretical approaches to the structure of the instrument were estimated. The results show (Table 2) that two-factor correlational, three-factor hierarchical without testlets, four-factor correlational and hierarchical, and unidimensional models poorly fitted the data (CFI ≤ .86). The inclusion of testlets substantially improved the fit indexes of the three-factor hierarchical model, χ2 = 121, df = 56, CFI = .93, RMSEA = .07, SRMR = .065; χ2/df = 2.16. This model was revised to include the correlation between two errors of variance, 9 and 14 (affectively insensitive/lack of empathy, absence of realistic long-term goals), significantly improving the fit of the model, Δχ2(1) = 14.67, p < .001. This improvement of the modified three-factor hierarchical model with testlets over the three-factor hierarchical model may be due to a carry-over effect of the evaluator since both items measure “abscence”. The factorial structure of the final model is shown in Figure 1. Figure 1. 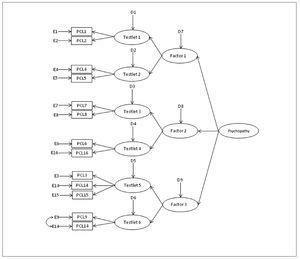 PCL-R Three-Factor Modified Hierarchical Model with Testlest (13 items). The results (see Table 3) show all of the first (testlets), second (testlets and factors), and third order (higher order factors) saturations were statistically significant, p < .001. Internal consistency for the shortened scale was adequate both for the total scale (α = .85) and for the three factors (factor 1: α = .77, factor 2: α = .81, factor 3: α = .73). The elimination of 7 of the 20 items from the original questionnaire entailed the need for calculating a new cut-off point for the classification of psychopathy. This may be undertaken using either of the two procedures proposed by Hare (1985, 1991): to prorate the score in relation to the decision criterion for the 20-item scale (raw score > 30), or the mean for the population plus 1 standard deviation (M = 13.5, SD = 5.54). In both cases, the cut-off score resulted in 19. When this criterion was applied to the score obtained on the 13-item scale, it classified 96.6% (n = 28) of those classified as psychopaths on the original scale (i.e., only one prison inmate classified on the original 20-item scale as a psychopath would have not been classified as such on the 13-item shortened version), that is, the shortened version would have classified as psychopaths all but one of those classified on the original scale, χ2(1) = 0.02, p = .900. Moreover, the 13-item scale classified 17 detainees as psychopaths who were not classified on the original scale. Therefore, in comparison to the original scale, the shortened scale significantly increased the psychopathy classification rate (.147 vs. .234, for the original and shortened version, r espectively),χ2(1) = 3.85, p < .05. In order to assess the classification of psychopathy on the 13-item scale, the means of the criminological variables related to psychopathy (classification factor: psychopath vs. no-psychopath) were compared: age of first detention, age of first prison sentence, length of prison sentence, and number of prison sentences served. The results (Table 4) reveal that prisoners classified as psychopaths were detained for the first time at an earlier age, with a medium effect size, d = 0.58, 95% CI[0.25, 0.91]; entered prision at an earlier age, with a small effect size, d = 0.41, 95% CI[0.07, 0.75]; had a longer history of reoffending, with a small to medium effect size, d = 0.43, 95% CI[0.10, 0.76], and were given longer prison sentences, with a big effect size, d = 0.71, 95% CI[0.37, 1.05]. Moreoever, to assess the validity of the classification, the relationship between the classification of psychopathy (classification: psychopath vs. no-psychopath) and the type of offence was analized. The results (Table 5) showed prisoners classified on the scale as psychopaths committed more crimes of vandalism and/or damage to property, with a medium effect size, OR = 2.43, 95% CI[1.08, 5.49]; illegal possession of firearms, with a big effect size, OR = 7.25, 95% CI[2.61, 21.79]; threatening behaviour and/or assault, with a medium effect size, OR = 3.40, 95% CI[1.29, 8.98]; robbery with intimidation and/or violence, with a small effect size, OR = 2.18, 95% CI[1.11, 4.26]; bodily harm and/or obstruction, with a medium effect size, OR = 2.66, 95% CI[1.36, 5.20]; and manslaughter, attempted murder, and murder, with a medium effect size, OR = 3.31, 95% CI[1.37, 8.07]. a) The results of this study show the three-factor hierarchical model with testlest (Cooke & Michie, 2001; Cooke et al., 2007; Skeem & Cooke, 2010) was the best model fit to data, i.e., the model with the greatest validity. In contrast, two-factor correlational, three-factor hierarchical without testlets, four-factor correlational and hierarchical, and unidimensional models had the poorest fit index. Thus, the testlets (latent variables) were responsable for improving the fit (the three-factor model without testlets obtained poor fit values). Thus, these results not only support the superiority of the three-factor hierarchical model (with testlets), but also the construct validity of the factorial structure, and the resulting (13-item) instrument. b) In relation to the models resulting from the original 20-item version, the three-factor hierarchical model with testlets was identified by CFA as the model having the best fit to data. The main distinguishing feature of this core model was that it eliminated items that evaluated delinquent behaviour (antisocial factor in the models derived from the original 20-item scale) and intimacy (sexual promiscuity and brief relationships). These results lend support to the clinical model (American Psychiatric Association, 1980, 1994, 2000, 2013), in which psychopathy is diagnosed in terms of affective-emotional, inter personal and antisocial behaviour criteria, leaving aside notions of criminal behaviour as a core feature of the disorder. Though studies have related both contingencies (Theodorakis, 2013; Vaughn, Howard, & DeLisi, 2008), Cooke et al. (2007) have highlighted that the relationship is not one of chance, but is rather characteristic of the disorder itself (e.g., irresponsibility, impulsivity, hostility, lack of empathy) that facilitate the involvement in delinquent behaviour. c) The highest psychopathy classification rate was obtained with the shortened version of the scale. Should the decision criterion be validated, it may prove to be useful for enhancing the correct classification and management of detainees during prison intake since it enables adaptive psychopaths, i.e., without a criminal record, to be identified and, in turn, for implementing the appropriate initiatives. It is of no surprise the adaptive psychopath is characterized by exhibiting striking self-assurance, social stability, assertiveness, and persuasive powers (Smith, Watts, & Lilienfeld, 2014), which in a prison context facilitates false adherence and progress in treatment, leading prison evaluation teams to inadequately evaluate the access to prison benefits, e.g., release permits, probation (Novo, Fariña, Seijo, & Arce, 2012). d) The effects of the classification of psychopathy on the shortened version of the scale and the designated decision criterion, were in line with previous studies. Thus, prisoners classified as psychopaths began their delinquent carreer at an earlier age than those not classified as psychopaths (Forth & Book, 2007; Vaughn et al., 2008), committed more violent crime (Porter, Birt, & Boer, 2001; Porter, Brinke, & Wilson, 2009; Porter, Woodworth, Earle, Drugge, & Boer, 2003), served longer sentences (Skeem, Poythress, Edens, Lilienfeld, & Cale, 2003), and had higher reoffending rates (Garrido, 2002; Grann, Langström, Tonhström, & Kulgren, 1999; Hare, 1993; Hart, Krop, & Hare, 1988; Hemphill, Hare, & Wong, 2011; Serin & Amos, 1995). Further research is required to examine if the shortened version of the PCL-R is valid for classifying psychopathy and to assess sensitivity and specificity in comparison to the original version. Should they be equally valid, this would enable the classification of psycho-pathy regardless of previous recorded delinquent behaviour, i.e., adaptative psychopathy. This shortened scale would be useful for decision-making regarding sentencing (Cox, DeMatteo, & Foster, 2010; Lloyd, Clark, & Forth, 2010), eligibility for temporary release orders and probation (Moltó, Poy, & Torrubia, 2000), early prevention and reoffenders (Arce, Fariña, & Vázquez, 2011), and for prison treatment programmes (Arce, Fariña, & Novo, 2014; Spaans, Barendregt, Haan, Nijman, & de Beurs, 2011). This study is part of the research Project MINECO-13-FEM2012-30659 and the Foundation for the Promotion of Applied Scientific Research and Technology (FICYT) in Asturias through pre-doctoral Grant BP09-147. *Correspondence concerning this article should be addressed to Beatriz Pérez Sánchez. Área de Personalidad, Evaluación y Tratamiento. Departamento de Psicología. Facultad de Psicología. Universidad de Oviedo. Plaza Feijóo. American Psychiatric Association (1980). Diagnostic and statistical manual of mental disorders (3rd ed.). Washington, DC: American Psychiatric Association. Anderson, J. C., & Gerbing, D. W. (1984). The effect of sampling error on convergence, improper solutions, and goodness-of-fit indices for maximum likelihood confirmatory factor analysis. Psychometrika, 49, 155-173. Arce, R., Fariña, F., & Novo, M. (2014). Competencia cognitiva en penados primarios y reincidentes: Implicaciones para la reeducación [Cognitive competence among recidivist and non-recidivist prisoners: Implications for the rehabilitation]. Anales de Psicología, 30, 259-266. Arce, R., Fariña, F., & Vázquez, M. J. (2011). Grado de competencia social y comportamientos antisociales delictivos y no delictivos en menores [Social competence and delinquent, antisocial, and non-deviant behavior in adolescents]. Revista Latinoamericana de Psicología, 43, 173-486. Arce, R., Velasco, J., Novo, M., & Fariña, F. (2014). Elaboración y validación de una escala para la evaluación del acoso escolar [Development and validation of a scale to assess bullying]. Revista Iberoamericana de Psicología y Salud, 5, 71-104. Book, A. S., & Quinsey, V. L. (2003). Psychopaths: Cheaters or warriorhawks?. Personality and Individual Differences, 36, 33-45. Brooke, P. P., Jr., Russell, D. W., & Price, J. L. (1988). Discriminant validation of measures of job satisfaction, job involvement, and organizational commitment. Journal of Applied Psychology, 73, 139-145. Browne, M. W., & Cudeck, R. (1992). Alternative ways of assessing model fit. Sociological Methods and Research, 21, 230-258. Forth, A., & Book, A. S. (2007). Psychopathic traits in children and adolescents: The relationship with antisocial behaviors and aggression. In R. Salekin & D. Lynam (Eds. ), Handbook of youth psychopathy (pp. 251-283). New York, NY: Guilford. García, J., Arango, J. C., Correa, O., Pérez, A. F., Hugo, V., Mejía, C. A., … Palacios, C. A. (2008). Validación de la lista de chequeo de la psicopatía revisada (PCL-R) en población carcelaria masculina de Colombia [Validation of the Psychopathy Checklist-Revised (PCL-R) in male prison population of Colombia]. Revista Colombiana de Psiquiatría, 37, 564-579. Garrido, V. J. (2002). El tratamiento del psicópata [The treatment of psychopath]. Psicothema, 14, 181-189. Grann, M., Långström, N., Tengström, A., & Kullgren, G. (1999). Psychopathy (PCL-R) predicts violent recidivism among criminal offenders with personality disorders in Sweden. Law and Human Behavior, 23, 205-17. Hare, R. D. (1985). The Psychopathy Checklist (Unpublished manuscript). University of British Columbia, Vancouver, Canada. Hare, R. D. (1991). Manual for the Revised Psychopathy Checklist (1 ed.). Toronto, Ontario, Canada: Multi-Health Systems. Hare, R. D. (1993). Without conscience: The disturbing world of the psychopaths among us. New York, NY: Simon & Schuster. Hare, R. D. (2003). Manual for the Revised Psychopathy Checklist (2 ed.). Toronto, Ontario, Canada: Multi-Health Systems. Hart, S. D., & Hare, R. D. (1996). Psychopathy and antisocial personality disorder. Current Opinion in Psychiatry, 9, 129-132. Hart, S. D., Kropp, P. R., & Hare, R. D. (1988). The performance of male psychopaths following conditional release from prison. Journal of Consulting and Clinical Psychology, 56, 227-232. Hauck, N. F., Pereira, M. A., & Martins de Almeida, R. M. (2014). Estrutura fatorial da escala Psychopathy Checklist-Revised (PCL-R): uma revisão sistemática [The factor structure of the Psychopathy Checklist-Revised (PCL-R): A systematic review]. Avaliação Psicológica, 13, 247-256. Hemphill, J. F., Hare, R. D., & Wong, S. (2011). Psychopathy and recidivism: A review. Legal and Criminological Psychology, 3, 139-170. LeBreton, J. M., Binning, J. F., & Adorno, A. J. (2006). Subclinical psychopaths. In J. C. Thomas & D. Segal (Eds. ), Comprehensive handbook of personality and psychopathology (pp. 388-411). New York, NY: Wiley. León-Mayer, E., Asún-Salazar, D., & Folino, J. O. (2010). Confiabilidad y validez de la versión chilena de la Hare PCL-R [Chilean version of Hare PCL-R: a study of reliability and validity]. Revista de la Facultad de Medicina, 58, 103-114. Lloyd, C. D., Clark, H. J., & Forth, A. E. (2010). Psychopathy, expert testimony and indeterminate sentences: Exploring the relationship between Psychopathy Checklist-Revised testimony and trial outcome in Canada. Legal and Criminological Psychology, 15, 323-339. Moltó, J., Poy, R., & Torrubia, R. (2000). Standardization of the Hare Psychopathy Checklist-Revised in a Spanish prison sample. Journal of Personality Disorders, 14, 84-96. Nicholls, T. L., & Petrila, J. (2005). Gender and psychopathy: An overview of important issues and introduction to the special issue. Behavioral Sciences and the Law, 23, 729-741. Novo, M., Fariña, F., Seijo, D., & Arce, R. (2012). Assessment of a community rehabilitation programme in convicted male intimate-partner violence offenders. International Journal of Clinical and Health Psychology, 12, 219-234. Porter, S., Birt, A. R., & Boer, D. P. (2001). 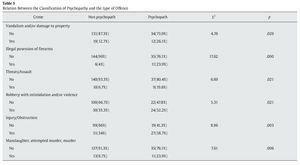 Investigation of the criminal and conditional release profiles of Canadian federal offenders as a function of psychopathy and age. Law and Human Behavior, 25, 647-661. Porter, S., ten Brinke, L., & Wilson, K. (2009). Crime profiles and conditional release performance of psychopathic and non-psychopathic sexual offenders. Legal and Criminological Psychology, 14, 109-118. Porter, S., Woodworth, W., Earle, J., Drugge, J., & Boer, D. P. (2003). Characteristics of sexual homicides committed by psychopathic and non psychopathic offenders. Law and Human Behavior, 27, 459-470. Serin, R. C. & Amos, N. L. (1995). The role of psychopathy in the assessment of dangerousness. International Journal of Law and Psychiatry, 18, 231-238. Skeem, J. L., Poythress, N. G., Edens, J. F., Lilienfeld, S. O., & Cale, E. M. (2003). Psychopathic personality or personalities? Exploring potential variants of psychopathy and their implications for risk assessment. Aggression and Violent Behavior, 8, 513-546. Torrubia, R., Poy, R., Moltó, J., Grayston, P. R., & Corral, S. (2010). PCL-R. Escala de evaluación de psicopatía de Hare revisada. Manual [PCL-R. Hare Psychopathy Checklist Revised. Manual]. Madrid, Spain: TEA Ediciones. Wheaton, B., Muthen, B., Alwin, D., & Summers, G. (1977). Assessing reliability and stabillity in panel models. In D. Heise (Ed. ), Sociological methodology. San Francisco, CA: Jossey Bass.